Happy Valentine’s Day! When people think Valentine’s Day, love, and romance, often wine or champagne will come to mind as an accompanying alcoholic beverage– but not this time, beer can be romantic too. 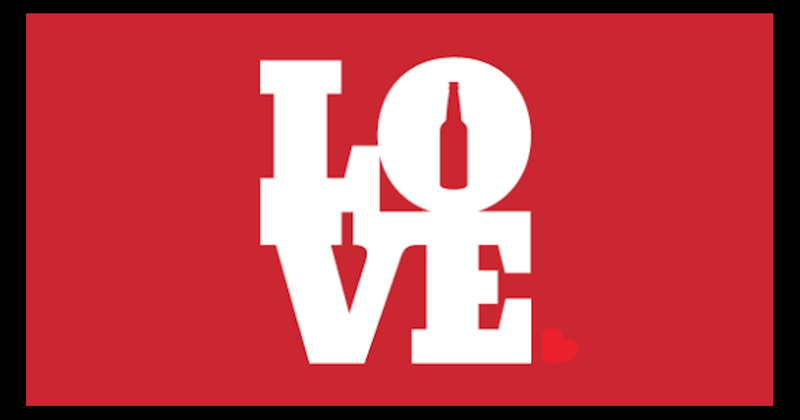 Check out these 9 beers that’ll really bring the romance this Valentine’s Day. If you and your date would rather drink chocolate than eat it, this is the beer for you. This chocolate porter also tastes great paired with, you guessed it, chocolate; chocolate cake, cookies, truffles. If you’re feeling extra adventurous this V-Day, try a Shake Chocolate Porter float… with two straws, obviously. You wouldn’t be doing Valenetine’s Day right without some strawberries. This year, try them in liquid form. This beer is perfect for couples celebrating their first Valentine’s Day together. The sweet deliciousness of this Strawberry Shortcake lager is bound to set the mood. This beer will bring you back to the days of your first crush. You’ll feel as though you’re back standing in your school cafeteria staring at the captain of the basketball team, completely infatuated with his every move. Lost in a world of unrealistic love where you didn’t have spinach stuck in your braces and a “Kick Me” sign on your back. Every time he swept his messy hair out of his eyes, the sky parted and the angels sang… Wait, what was I talking about again? This rich and smooth stout is for the person who wants to show how deep and pure their love is but just can’t find the right words. Notes of molasses, figs, coffee, and chocolate will make you feel warm and comfortable… 12% ABV will also help. Let this imperial stout do the talking for you. Imagine showing up to your Valentine’s Day date and saying “I brought you a big bottle of Sexual Chocolate”, and before your date can say a word, slowly raise a bottle of this imperial stout without breaking eye contact. Your date may be confused at first, but after tasting what this beer has to offer, they will love you even more. For extra effect, wink after every time you say ‘Sexual Chocolate’. This wheat beer is perfect for those couples who are taking it easy this V-day. Whether you’re watching Netflix or eating Chinese take-out, this brew will add the perfect amount of love and romance to your night. This beer is for those who are flying solo this Valentine’s Day. Or for those who are throwing a “I Hate Valentine’s Day” party with all your single friends. Or if you and your boo just really like bitter beers, this is for you too. Pairs perfectly with an entire box of chocolates and I Don’t Wanna Miss A Thing by Aerosmith on repeat. Try bringing a different flower bouquet this year. Your beer loving bae will love a six-pack of these Jasmine IPAs. Well, hopefully. Maybe bring the real flowers too, just in case. Here’s another beer for anyone spending Valentine’s Day alone. Wrap up in your favourite blanket and put on your favourite show. This beer is the only date you’ll ever need. Ok, maybe not.. but it should do for tonight.